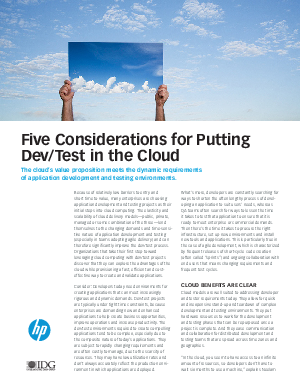 Cloud models are well suited to addressing developer and tester requirements today. They allow for quick and inexpensive stand-up and teardown of complex development and testing environments. They put hardware resources to work for the development and testing phases that can be repurposed once a project is complete. And they ease communication and collaboration for distributed development and testing teams that are spread across time zones and geographies.